David Lloyd has perhaps the most rounded and comprehensive CV in cricket, writes ERIC BROWN. Lloyd graduated from the Lancashire League to become a county cricket captain, England player, first-class umpire, England coach, newspaper columnist, author and radio and television commentator. He almost made the ultimate sacrifice for his country in an Ashes Test. When a Jeff Thompson rocket delivery thudded into his midriff the ball split his protective box which then tried to clamp shut over his wedding tackle as he grovelled around on all fours. The resulting photograph published around the world encapsulates the most memorable moment of his career and is among a whole catalogue of chuckle-raising asides in Lloyd’s latest book. From his early days as a spotty teenager earning promotion to Accrington’s Lancashire League XI alongside one Wes Hall to his latest adventures covering 20-over thrashes for Asian TV, Lloyd lets us have it all. No book of this type would be complete without its Truemanisms. Fred Trueman, Yorkshire and England’s greatest paceman in the 1960s, apparently regarded it as his right to capture the wickets of at least five opponents each innings. He’d get the openers out, rest then return to break a mid-innings partnership before dismissing the tail. He called them paupers. Ask cricket followers about Lloyd and they’ll remember him as an accomplished left-handed batsman usually cast in the top three. They often forget his bowling. He is self-effacing about this but his non-turning left-arm slows were good enough to claim 237 first-class wickets including greats like Garry Sobers and Viv Richards. He confesses the biggest regret of his playing career was failing to do himself justice in the ultra-competitive arena of Roses derbies. Somehow he seemed to freeze on the big days of Lancashire-Yorkshire contests. Lloyd is perhaps at his best recalling past escapades of his playing days but is equally forthright on the direction of the modern game. He doesn’t hold back on the effect 20-over cricket is having on the county and Test brands, the crowded Test fixture list, lopsided county fixtures plus the commercial side of the sport. This latest offering in collaboration with Daily Mail cricket writer Richard Gibson follows the successful formula achieved by their previous publication Last In The Tin Bath. Part autobiographical and part travelogue, it has a wealth of stories about the characters Lloyd has met, played with and watched over a lifetime dedicated to cricket. There’s not much on his experiences as an umpire but perhaps Lloyd and Gibson are holding this back for another volume. It should be a belter. 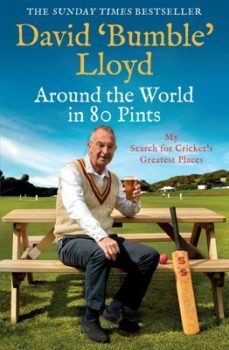 Around The World in 80 Pints by David Lloyd is published by Simon & Schuster. Price £20.